Butler University and the Indiana University Robert H. McKinney School of Law will create the “Butler University Law Scholar,” a partnership that will allow Butler to nominate one student each year to enroll in the law school and receive a minimum half-tuition scholarship. Graduating seniors and alumni—who often take a gap year or two before applying to law school—will be eligible for the scholarship. The first scholar will be named in time for the 2016 fall semester. Applicants will apply to both the McKinney School and the Center for High Achievement and Scholarly Engagement (CHASE) office at Butler. CHASE Director Rusty Jones and pre-Law adviser Jim McKneight will vet the applications and recommend several candidates to be considered by McKinney for the Butler University Law Scholar honor. The Butler University Law Scholar also will be guaranteed an experiential learning opportunity, either an externship or a paid research assistantship, after he or she completes 31 hours of coursework. “Our new partnership provides a wonderful opportunity for our students while at the same time raising the profile of the McKinney School of Law among law school-bound students at Butler,” Butler Provost Kate Morris said. 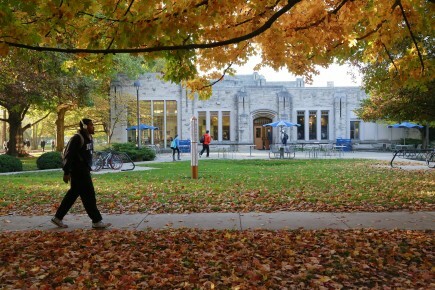 Jones said the McKinney School, which has scholar arrangements with other private universities in Indiana, approached Butler about creating the partnership. U.S. District Judge Jane Magnus-Stinson ’79, who earned her law degree from McKinney in 1983 and is a member of the Butler Board of Trustees, encouraged the establishment of the partnership. Roughly 25-30 Butler graduates go to law school in an average year, Jones said. Last year, six went to McKinney.